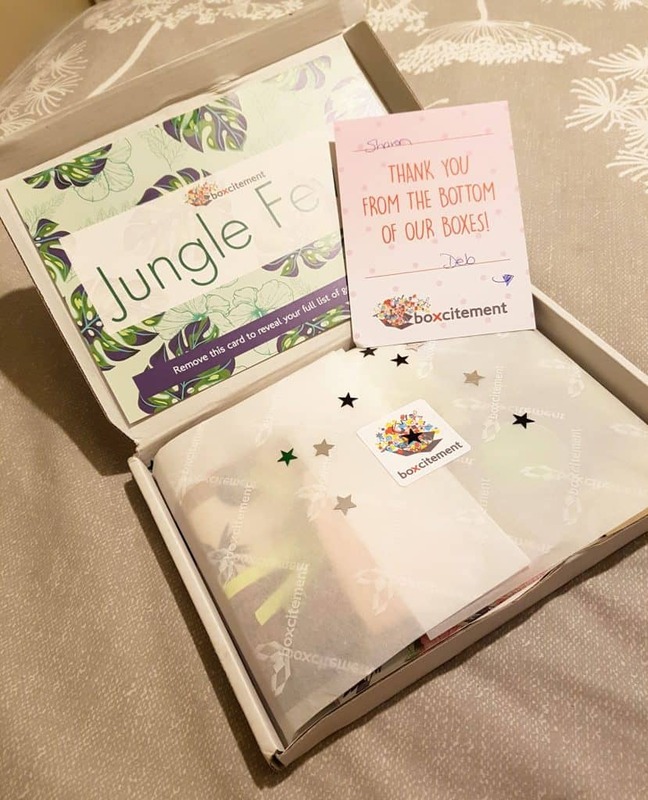 Home Reviews Boxcitement – October 2017: Welcome to the jungle! I had heard of Boxcitement but hadn’t had the chance to try it for myself so I was really excited to review the October box. 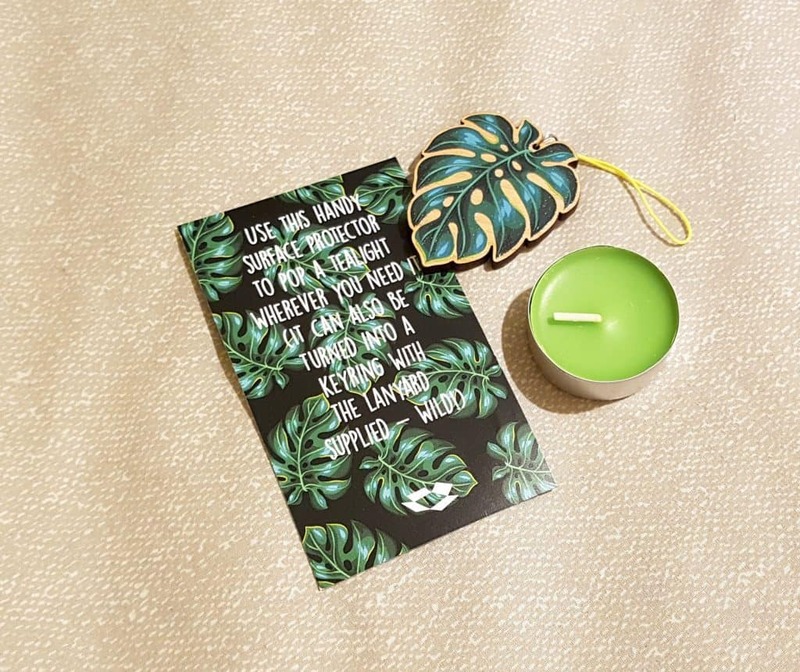 The team behind Boxcitement are Deb and Sean and they work with a team of designers and makers to curate a fantastic monthly box full of stationery, jewellery, gifts and crafts. They call themselves a ‘gift shop in a box’ and I think this is the perfect description! As you can see when you open the box everything is really well packaged and it is a real treat to come home to and explore! 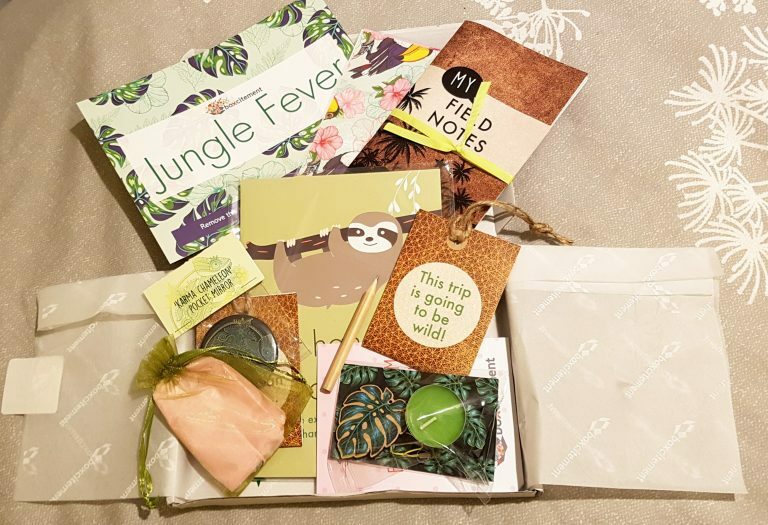 The October box was ‘Jungle Fever’ themed and included the following; a wooden earring stand featuring an adorable sleepy sloth; a pair of exclusively designed laser engraved earrings; a tropical tealight surface protector and tea light; three lovely tropical postcards; a karma chameleon pocket mirror; a quirky ‘field notes’ themed notebook and pencil; and a couple of luggage labels. As a huge jewellery fiend I absolutely loved the earrings and I have a massive soft spot for sloths so the stand was also lovely too. I think these two items alone justify the price of the box (£18 including p&p). The fact the stand comes ‘flat packed’ (you slot the stand part into the base) is a real bonus as I think it would be the perfect thing to take with you on your travels. I am a big fan of a jewellery wrap but then I find they just sit in there and I forget what I have brought with me! 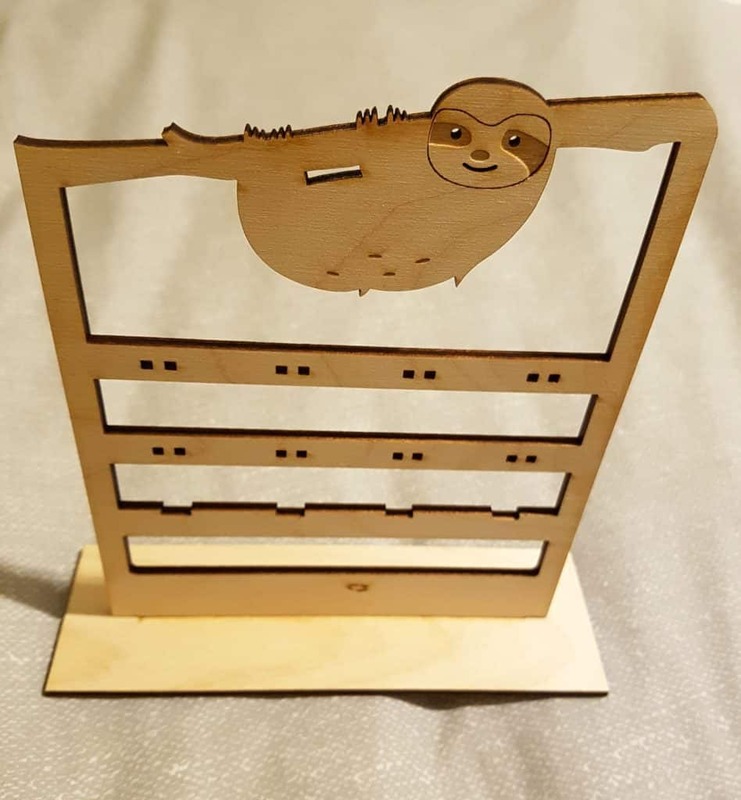 It would be lovely to see this little fellow smiling at you whilst also looking after all of your earrings (and you can always use the top part to hang bracelets and necklaces too). 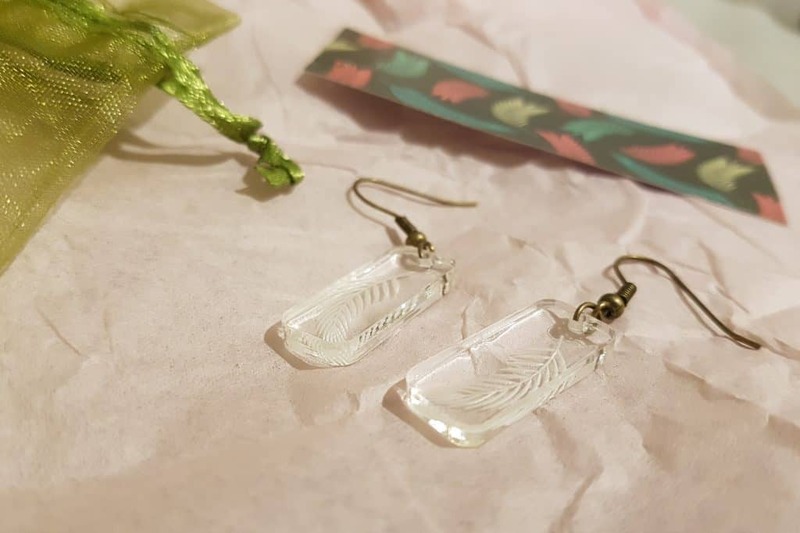 The earrings that come in the pack, as you can see, are really unusual and I have worn them loads since I got my box last week! I liked the fact that there was a clear theme, but also the fact that you could get a lot of use out of the individual parts. 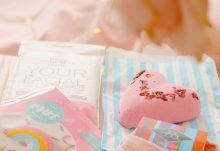 Sometimes you get a subscription box and it’s incredibly exciting and fun, but once the excitement has died down and you’ve made use of the products (or in some cases gifted the ones you don’t like to other people!). However with this box I know that I’ll make use of the items for some time to come. 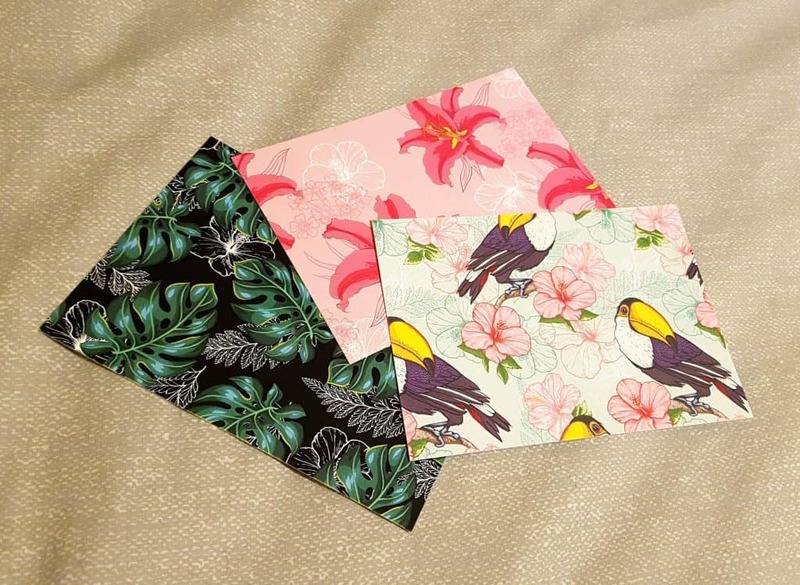 The postcards are going to go up on my wall, the notebook, pencil and luggage tags (so long as they are not commandeered by my son) will be put to use for our next holiday and the mirror is already in my handbag! One thing that I thought was a really lovely touch was the candle and surface protector. I have never really been one of those people who takes fancy candles with them when I go away, but having smelt this one and seen how handy the protector is I think I might just start. I love the fact this is so portable and I’ll definitely be packing it in my bag next time I am off on an adventure. I am so pleased I got the Boxcitement experience as it’s now on my list of ideas for presents. The fact you can order a one off box as a gift for someone (or yourself!) is a really strong selling point and I think this would make the perfect gift for a friend who is difficult to buy for. Deb and Sean claim that each box is “aimed at surprising and delighting you” and I can definitely say that was my experience! In all honesty, I only marked this box down ever so slightly as I don't believe in giving anyone a perfect score! There is always room for improvement, but really in the case of Boxcitement, that room is really quite tiny. Some might think £18 for a monthly subscription box is a lot but I would definitely say that in this case the cost was justified and I definitely think the value of the items I received was more than £18. Personally I couldn't afford/justify receiving a monthly box at this time but I know that if I could, the day it arrived would be my favourite day of the month. If you're looking for a unique monthly treat for yourself, or a lovely and quirky present for a family member or a friend I don't think you can go wrong!